DarkCoin (DRK) is a fairly new alternative crypto that uses a new chained hashing algorithm approach and that means it will require a specialized miner with support for this new algorithm. 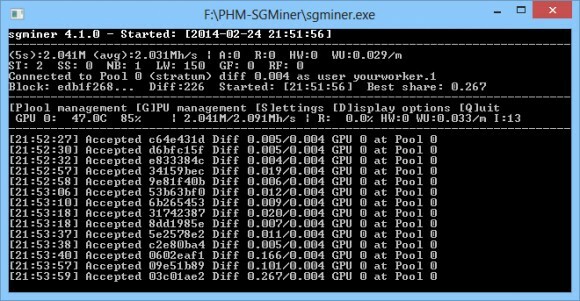 There is already a modified version of sgminer 4.1.0 (based on cgmner 3.7.2) that comes with support for DarkCoin that you can use for mining under Windows on your OpenCL GPU suh as Radeon R9 280X. The PHM modified version of sgminer also supports Qubitcoin and Quarkcoin mining as well as a few other algorithms used by different cryptos (check the kernels folder for the available options). Below you can download the modified version of sgminer with DarkCoin support for mining on GPU under Windows.